Sept. 21, 2018, 8:30 a.m.
By Laura Hazard Owen @laurahazardowen Sept. 21, 2018, 8:30 a.m.
Engagements with fake sites on Twitter, meanwhile, have continued to rise, though Twitter remains much smaller than Facebook. The researchers also compared the spread of stories from fake sites to the spread of stories from legitimate sites and found that those interactions have been “relatively stable over time” — suggesting further that it’s the fake news sites, in particular, that are being affected. One thing to be super clear about: Facebook is way bigger than Twitter and there is still a ton of fake news there — and much more, in sheer numbers, than there is on Twitter. 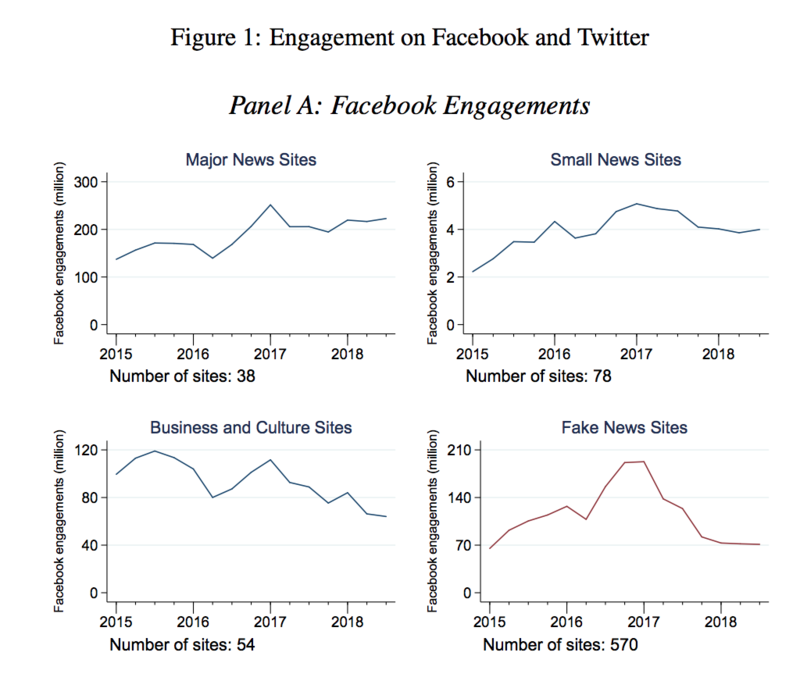 The absolute quantity of fake news interactions on both platforms remains large…Facebook in particular has played an outsized role in its diffusion. Figure 1 shows that Facebook engagements fell from a peak of roughly 200 million per month at the end of 2016 to roughly 70 million per month at the end of our sample period. As a point of comparison, the 38 major news sites in the top left panel — including The New York Times, Wall Street Journal, CNN, Fox News, etc. — typically garner about 200-250 million Facebook engagements per month. 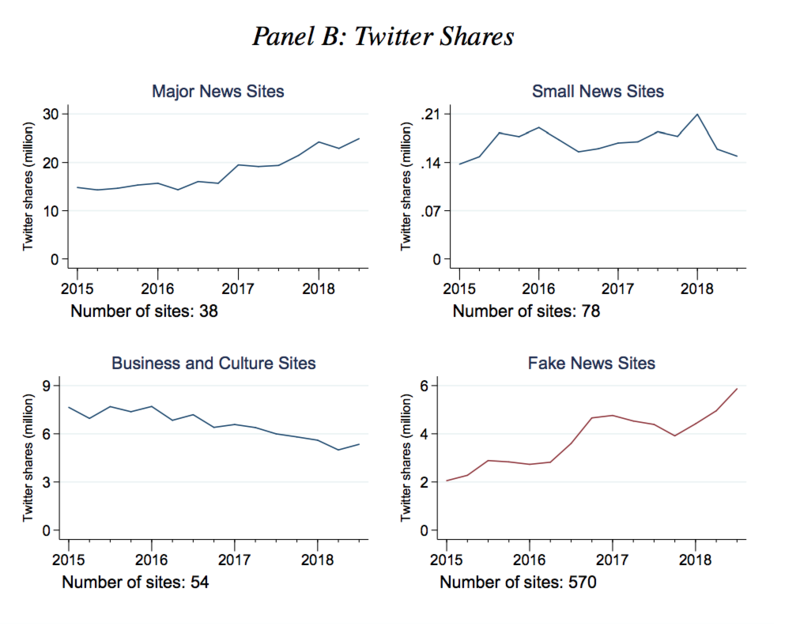 On Twitter, fake news shares have been in the 4-6 million per month range since the end of 2016, compared to roughly 20 million per month for the major news sites. The study looked at engagement on all articles from a given website, whereas Facebook has focused much of its effort on limiting specific stories that its users or third-party fact-checkers have flagged as false. In other words, Facebook isn’t trying to throttle all the content from the sites examined in the study, so we shouldn’t expect their content to disappear from the news feed. “Choosing what to amplify is not the same as curtailing someone’s ability to speak.” Here’s the text of a keynote that danah boyd, founder of research institute Data & Society, gave at ONA last week. Mainstream journalists are getting played, boyd says. 1. Create spectacle, using social media to get news media coverage. 2. Frame the spectacle through phrases that drive new audiences to find your frames through search engines. 3. Become a ‘digital martyr’ to help radicalize others. The concept of “crisis actors” is a good example of this. Manipulators aren’t trying to get journalists to say that witnesses to gun violence and terrorism are actually crisis actors. 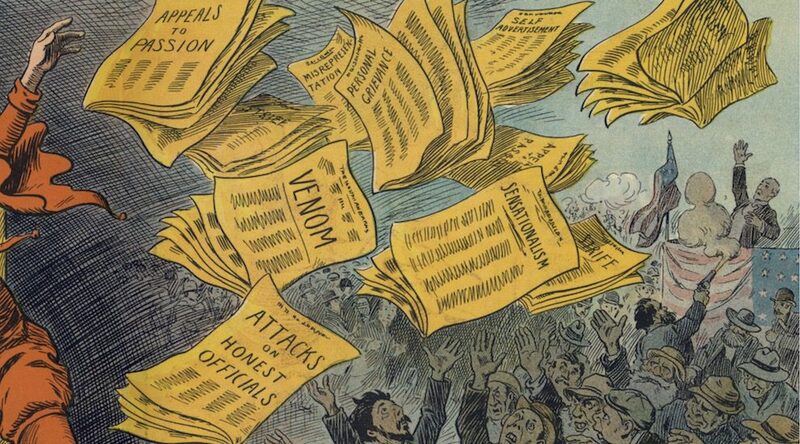 Their goal is to get the news media to negate that frame — and negate the conspirators who are propagating that frame. This may be counter-intuitive, but when news media negates a conspiratorial frame, the people who are most open to such a conspiracy will want to self-investigate precisely because they don’t trust the news media. As a result, negation enables a boomerang effect. I get that you feel that it’s important to cover “both sides” of a story. But since when is intolerance and hate a legitimate “side”? By focusing on bystanders and those who are victimized by hate, you can tell the story without reinforcing the violence. Extremists have learned how to use irony and slippery rhetoric to mask themselves as conservatives and argue that they are victims. Ignore their attention games and focus your reporting on the wide range of non-hateful political views in this country that aren’t screaming loudly to get your attention. There is no need to give oxygen to fringe groups who acting like the bully in the 3rd-grade classroom. Inform the public without helping extremists recruit. This isn’t about newsworthiness. And it’s unethical to self-justify that others are using the term. Or that people could’ve found this information on social media or search engines. Your business is in amplifying what’s important. So don’t throw in the towel. Many identify themselves primarily as libertarians or conservatives. Others self-advertise as white nationalists. Simultaneously, these influencers often connect with one another across ideological lines. At times, influencers collaborate to the point that ideological differences become impossible to take at face value. For example, self-identified conservatives may disavow far-right extremism while also hosting explicit white nationalists on their channels…Many of these YouTubers are less defined by any single ideology than they are by a ‘reactionary’ position: a general opposition to feminism, social justice, or left-wing politics. There are two main ways that these influencers “differentiate themselves from mainstream news as a way to appeal to young, disillusioned media consumers,” Lewis writes — first, by stressing their “relatability, their authenticity, and their accountability” to their audiences and second, by providing “a likeminded community for those who feel like social underdogs for their rejection of progressive values.” (Part of this entails “consistently project[ing] the idea that nonprogressives are ‘persecuted against’ because of their beliefs.”) These strategies — being relatable, authentic, accountable! Providing community! — are, of course, also exactly what traditional news organizations are trying to do to appeal to more readers. The platform currently provides Silver, Gold, and Diamond awards for content creators who have reached 100,000, 1 million, or 10 million subscribers, respectively. At this point, the platform reviews channels to make sure they do not have copyright strikes and do not violate YouTube’s community guidelines. At these junctures, the platform should not only assess what channels say in their content, but also who they host and what their guests say. In a media environment consisting of networked influencers, YouTube must respond with policies that account for influence and amplification, as well as social networks. POSTED Sept. 21, 2018, 8:30 a.m.
Owen, Laura Hazard. "Facebook’s attempts to fight fake news seem to be working. (Twitter’s? Not so much.)." Nieman Journalism Lab. Nieman Foundation for Journalism at Harvard, 21 Sep. 2018. Web. 20 Apr. 2019. Owen, Laura Hazard. "Facebook’s attempts to fight fake news seem to be working. (Twitter’s? Not so much.)." Nieman Journalism Lab. Last modified September 21, 2018. Accessed April 20, 2019. https://www.niemanlab.org/2018/09/facebooks-attempts-to-fight-fake-news-seem-to-be-working-twitters-not-so-much/.